I have been thinking of a concept which is of interest to sales engineers, their management and also mathematicians who like studying sales engineering. A vector as many of you know is an entity with both magnitude and direction - which is used to measure many things such as forces. These are things where it is important to know both the strength and direction of the entity. So the concept of today is the Versatility Vector. It is a measure of your depth of knowledge against your depth of knowledge in any specialised field, as rated against those specialists. 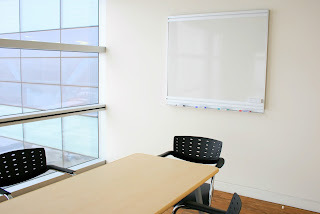 It is important in team make up, especially when it is difficult to ensure a specialist can be arranged for each meeting, or where multiple specialists are required, that a good number of highly versatile characters exist. FLEDGELING (bottom left). Those who don't have high knowledge in any area or in any broad range. 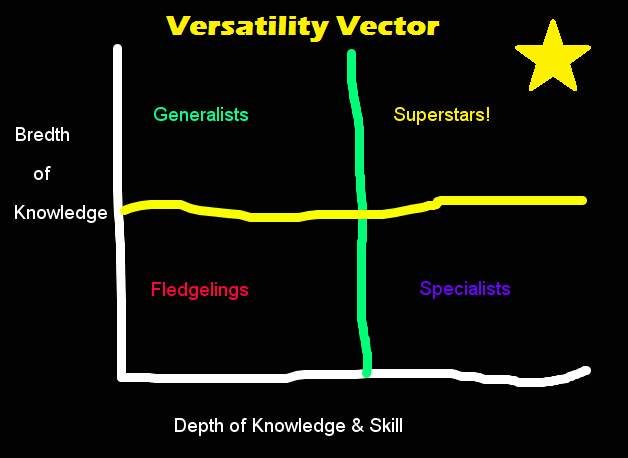 The key skill for a FLEDGELING is to learn quick and move into a different quadrant. 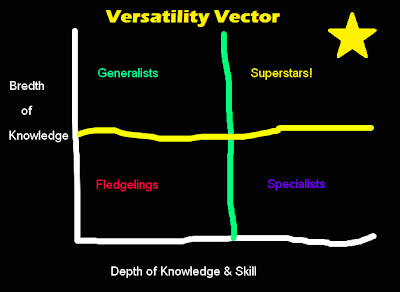 GENERALIST (top left) has high versatility but low knowledge depth. These GENERALISTs are grat at starting and going on roadshows where a wide variety is needed, but will need SPECIALISTS to help finish the job. SPECIALISTs (bottom right) these are the super knowledgeable but highly focused to their field of knowledge. Their job is to fulfill tasks that fit their niche(s) and pass on everything else. Over time specialists may broaden and add to their knowledge, or else they might prefer to stay in their field if kept fully occupied. SUPERSTARS (top right) these are the folks who can do it all. New concepts come to them easily and they keep pushing the boundaries of their knowledge. Complacency of these types means that they can be forced into specialism or lose their edge and become more general. Next article I will go into more detail on the effect these different types have on team make-up, and also the effect of adding further fields of knowledge to the mix.